This year, our holiday destination was France. Our plans started with a stay in Aubetrerre Sur Dronne in the beautiful Dordogne to celebrate Dani’s wedding. We wanted to make the most of the French countryside so decided to extend our stay for a few days. Our hunt began with finding somewhere unique to stay for a little adventure. My first port of call is always Mr & Mrs Smith. They seem to have the best boutique hotels at an affordable price. On their website you just pop in the areas you’re interested in and wait to see what stylish B&B’s, guest houses or hotels they have to offer. Le Raelais de Franc Mayne came up in our search and I fell in love with it straight away. First of all it was in was in Saint-Émilion, which just happens to be my husband’s favourite wine region, so a few points scored there! Secondly it looked amazing. Part boutique-hotel, part working winery Le Relais de Franc Mayne is surrounded by the château’s seven-acre vineyard. The hotel has anatural swimming pool that sits serenely under the cedar trees, overlooking rolling vineyards. Its chemical-free pool is self-cleaning thanks to specially selected aquatic plants and is heated by warmth-retaining stones, which means it’s eco-friendly. 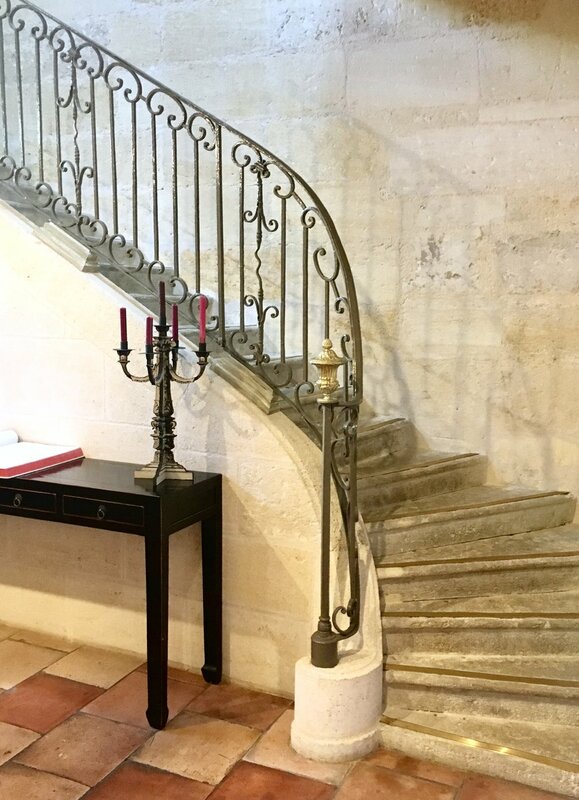 The hotel is a 15 minute walk to the little town of Saint-Émilion. 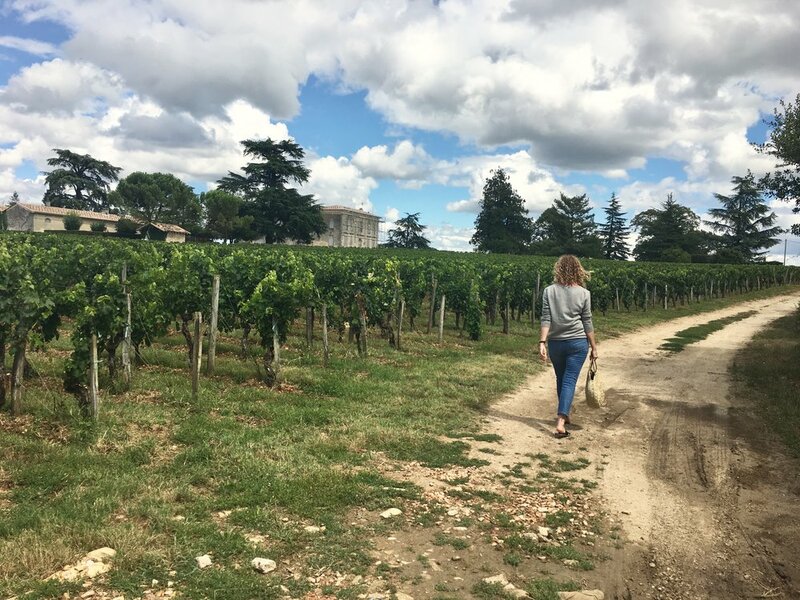 It’s the most beautiful stroll through all the vineyards, where you’ll pass at least seven other chateaux, which is incredible for such a small distance. You’ll then be set for an afternoon's wandering through ancient cobbled streets, with Romanesque churches and mediaeval ruins to explore. 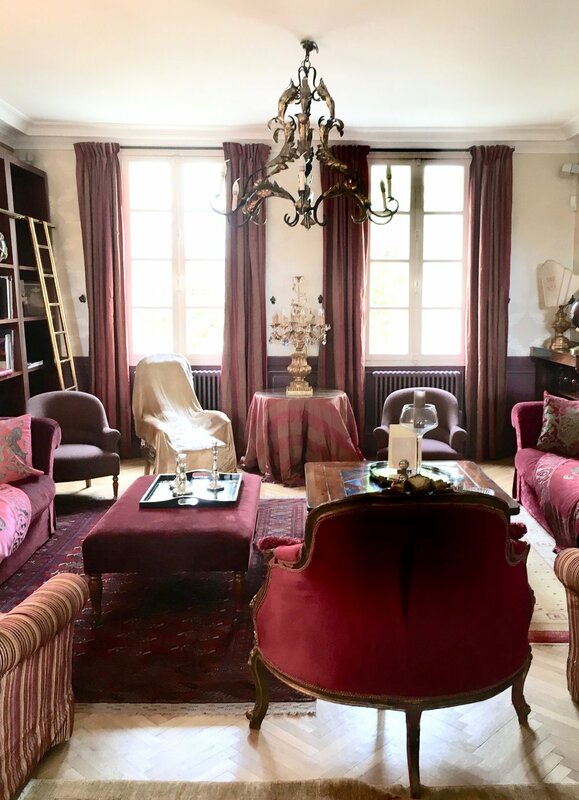 Château Franc Mayne has a welcoming family-run feel as soon as you arrive at the hotel. The staff are warm, friendly and full of helpful advise and always on hand to help with wine tours or restaurant dilemmas. The decor of the chateau is bold, classy and has a fun element throughout. Its nine uniquely styled rooms feature hand-picked antiques and furnishings, from pop art to Out Of Africa. We picked the ‘Black and White’ room. It was the most reasonable in price and we loved how it was such a big contrast to it’s surroundings. The dining room - where breakfast is served is elegant with chandeliers and rustic terracotta stone floors. It’s a communal space where everyone who’s staying gets to a enjoy a delicious simple french breakfast which is produced locally. It’s also a chance to chat to other guests and find out about any must-see Chateaux or wine tours. You certainly won’t be disappointed with the rest of the hotel. There’s a gorgeous white stone fireplace supporting an antique gold-framed mirror, and the whole room is softly lit by a golden chandelier. Here you can play chess or if that doesn’t take your fancy there’s always the pool room. I can’t recommend Château Franc Mayne enough. It’s roughly £160 a night which includes a delicious glass of wine when you arrive and a wonderful wine tour. You can order lunch (£6 per head) or dinner (£12 per head), which can be cooked at you convenience and is all locally produced and delicious. Or simply enjoy sitting on the terrace with a bottle of wine watching the sun go down over the natural pool and the very tranquil countryside. Surprisingly with all this, it’s also very child friendly, so you can enjoy the wine tours and the children can enjoy the pool. For us it was the perfect romantic break. I just had to persuade my husband that he couldn’t have Pomerol for breakfast! This hotel may seem an above average fee to stay here but you will definitely get an above average experience, and it’s worth every penny. 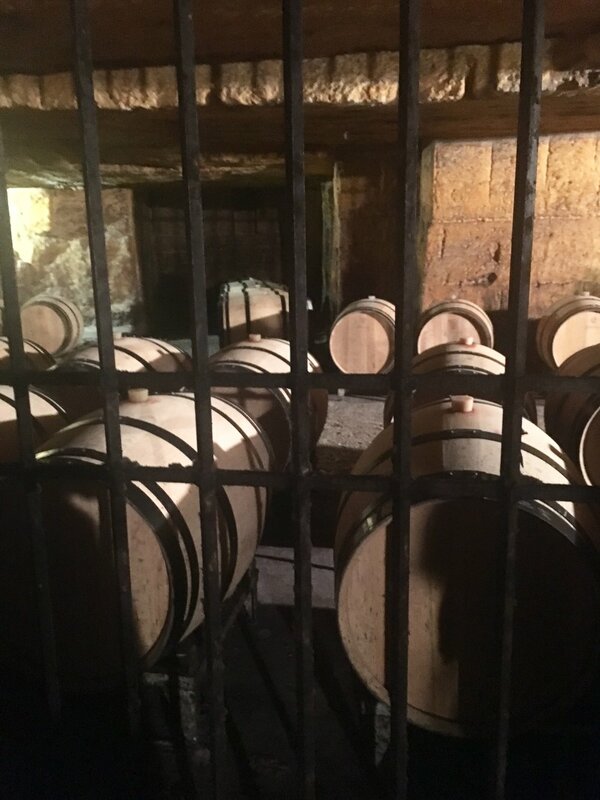 Don't miss the complimentary winery tour and tasting, you’ll be given a tour of the château’s wine-making equipment, including the impressive new vat in the reception area and the cavernous cellars where the seemingly endless row of barrels are stored. Plus, a visit to the spectacular atmospheric limestone caves where the wine is now aged in barrels. The tour is interesting, informative and fun, you just have to try and resist spending a small fortune on their delicious wine. We didn’t manage that and treated ourselves. We had to have a couple of cases shipped back! It’s hard to resist buying a £24 bottle of wine that would cost over £70 at home. I’d strongly urge you to buy any wine from the producers. Whether it’s for quaffing or shipping you pay a really low price per bottle. 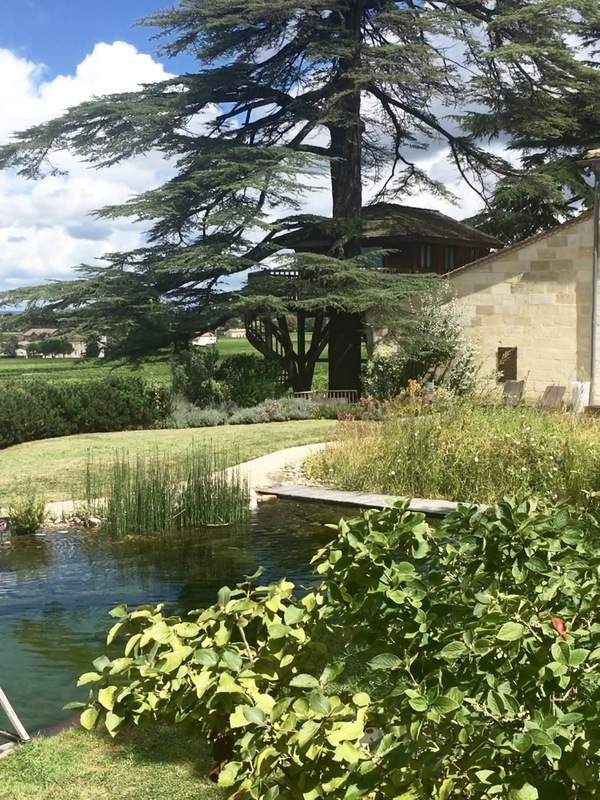 Buying from wine shops in Saint-Émilion is convenient but you pay two or three times more and it feels a bit like a tourist trap. And going to the vineyards is fun! 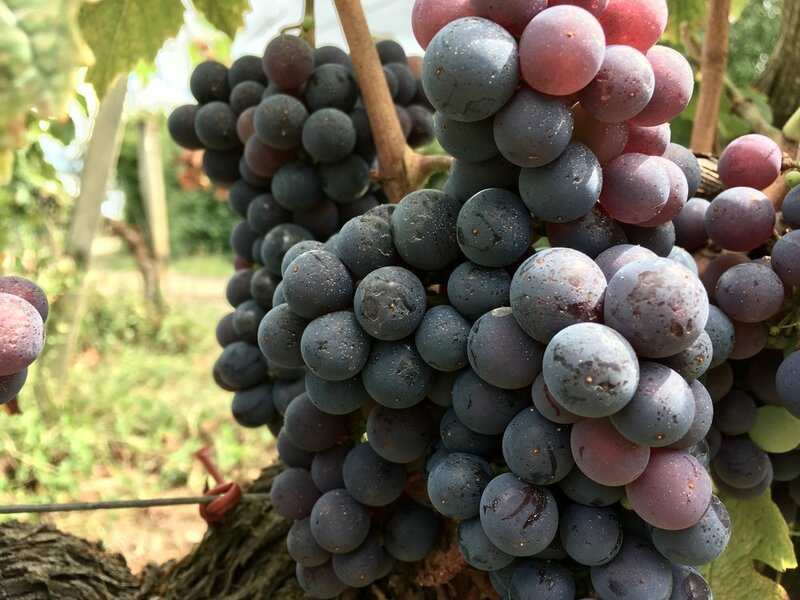 Part two of our trip will be next week where I can give you all my tips on wine tasting in Saint Émillion.